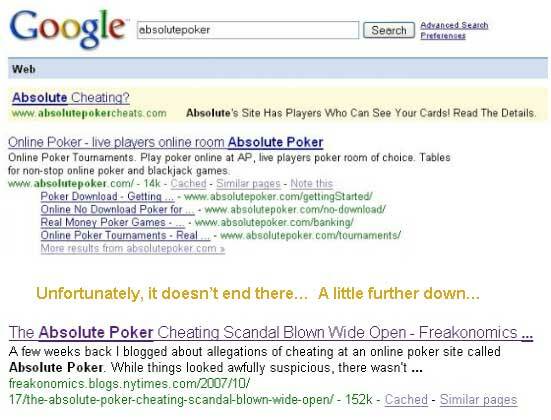 This was quickly becoming a public relations nightmare.Â So what can you do when something like this happens?Â Well, in the world of SEO, there are a few things you can do to mitigate the damage immediately.Â It comes down to pulling down the value of the page or bringing up the value of your pages so that the listing gets pushed off of the first page. But this is only part of the solution.Â In an ideal situation, you will have proactively spent resources in making sure that anything listed under your name or company are high ranking pages that YOU control. That means that it becomes very difficult for someone to get themselves associated with your company that you don’t want, but more importantly, you can respond to threats to your reputation because you have a number of strategically placed pages where you can do damage control.Â Online reputation management is quickly becoming a new essential tool for public relations and media management. This entry was posted on Sunday, October 19th, 2008 at 11:50 pm	and is filed under SEO News. You can follow any responses to this entry through the RSS 2.0 feed. You can leave a response, or trackback from your own site. Definitely the reputation management is important for companies, but how can one bring someone’s website down when s/he has no control over it. You should also write a post for this.